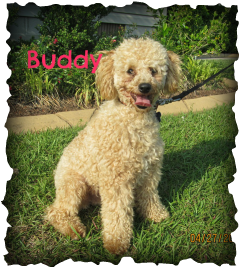 "Buddy" is a Buff / Red Toy Poodle male. He is a Pure Breed Stud, registered with the Continental Kennel Club. He weighs 11 lbs. "Cloe" is a Black & White Shih-Tzu female. She is registered with the Continental Kennel Club. She loves to romp and play in the yard. She weighs 10 lbs. 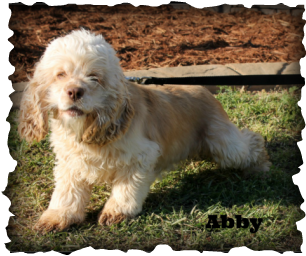 "Abby" is an Apricot Cocker Spaniel and has been tested w/ OFA & PennHip scoring better then the breed average. She is registered with the American Kennel Club. She weighs 22 pounds. 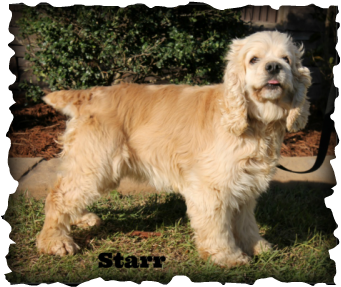 "Starr" is a Buff Cocker Spaniel. She is registered with the American Kennel Club. She is a lovely little lady who is full of energy. "Denali" is an Apricot Cocker Spaniel. She is registered with the American Kennel Club. She is a lively one, who loves to play.
" Riley " is a Red Cocker Spaniel and has been tested w/ OFA & PennHip scoring better then the breed average. She is registered with the Continental Kennel Club. She weighs 30 lbs.
" Bella " is a Parti color White & Black Cocker Spaniel and has been tested w/ OFA & PennHip scoring better then the breed average. She is registered with the Continental Kennel Club. She weighs 29 lbs.
" Cassie " is a Parti color White & Red Cocker Spaniel and has been tested w/ OFA & PennHip scoring better then the breed average. She is registered with the Continental Kennel Club. She weighs 25 lbs.
" Meo" is a 1st generation Cockapoo. She is registered with the American Cockapoo Club. She weighs 15 lbs. "Kelsi II" is an Apricot Cocker Spaniel. She is registered with the American Kennel Club. She is full of energy. "Tasha" is an Apricot Cocker Spaniel. She is registered with the American Kennel Club. She is a lovely little lady who is full of energy. She weighs 22 pounds. "Teasha" is a Buff Cocker Spaniel. She is registered with the American Kennel Club. She is a gentle girl who loves to play. She weighs 22 pounds. "Sophia" is a Parti Black & White Cocker Spaniel. She is registered with the American Kennel Club. She is a great Mom to her little ones.